The Polish interior professionals are back with a brand new outrageous interior, this time the Chevy Camaro ZL1 was the victim of Carlex Design’s outlandish ways. 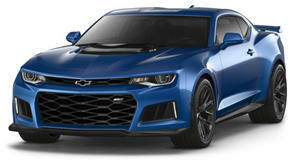 The all-new ZL1 is slated to arrive sometime next year as a 2017 model, but there’s plenty of life left in the current model. So if you own one of these all-American brutes, why not give it a new lease on life like this guy did. Surely you can’t go wrong with a black and yellow leather interior to match the Bright Yellow body paint? As you can see, wrong is exactly what this is. Inspired by Lamborghini’s own shade of yellow, the two-tone Nappa leather is complemented by some fancy airbrushing on the dash and door panels, but the Bumblebee look didn’t need any help to look any worse.